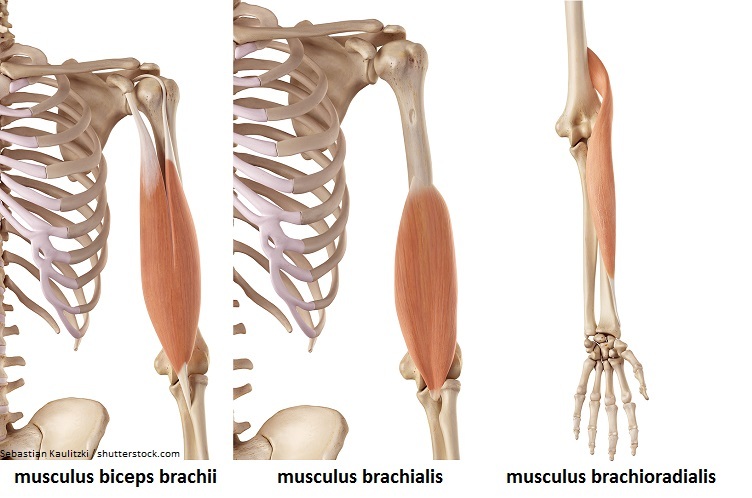 The musculus biceps brachii belongs to the arm muscles. It is very popular and symbolic for muscular strength and athletics. The musculus biceps brachii is located on the front of the upper arm and consists of a long head (caput longum) and a short head (caput breve). The long head originates from the upper edge of the shoulder socket at the shoulder blade (tuberculum supraglenoidale scapulae). The short head has its origination at the coracoid process (processus coracoideus). Both heads insert into the bony roughness at the radius (tuberositas radii). Both heads of the musculus biceps brachii bend the elbow joint and rotate the palm of the hand upwards (supination). Additionally, the long head abducts the arm and rotates it inwards. The short head also adducts the arm and moves it forward (anteversion). In its main function the bending of the elbow joint the biceps is being supported by the musculus brachialis and the musculus brachioradialis. The musculus biceps brachii is very popular among body building athletes and symbolizes great strength if well pronounced. But we shouldn’t forget its importance in our daily life. The biceps and the other elbow flexors are involved in almost all motions of our arm and for that reason essential. It happens quite easily to overstrain these muscles what could cause complaints, like a tennis elbow. It is recommendable to exercise these muscles softly on a regular basis.